Wahu Surfer Groms Comp, Coffs Harbour ran in punchy two-to-three foot waves at Diggers Beach over the weekend. Nathan McKenzie, Angus Baker, Dembe Ryan, Jack and Harry O'Brien headed South to Coffs to have a crack. 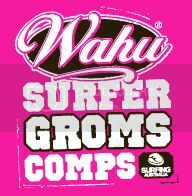 The Wahu Surfer Groms comps cater for the mini, mirco groms (U/8) to the big kids alike (U/14) of any level, and is all about providing a fun, but competitive environment. Over the years this series has provided our keen grommets their first chance at competing out of town against the next crew of up coming little rippers. Harry O'Brien made the Under-8 Mixed final and finished 3rd. Jack O'Brien also finished 3rd in the Under-10 Boys. Congratulations fellas.